Occasionally I like to delve deeper and listen to records that are a little bit older. Stormwinds Of Ages is one such record, having been released by Austin, TX extreme metallers Vesperian Sorrow in 2012 via The Path Less Traveled Records. It also turns out that Stormwinds Of Ages is the band's last output for a while, as they're busy focusing on other projects. 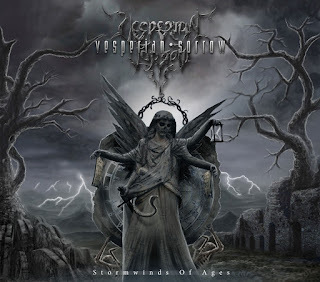 After beginning life as "Unholy Descent" about a decade ago, they gained guitarist "William" and changed their name to Vesperian Sorrow in 1997. A demo and three earlier full-lengths followed before the release of this record. Their popularity in extreme metal circles has grown steadily over recent years and it will surely have been helped by their appearance on Morbid Angel's "20th Anniversary of Covenant" tour in 2013. Vesperian Sorrow begin with a rousing intro entitled Sanguis Vitam Est, which conjures images of ancient battles before being abruptly cut short as the title-track takes over. Stormwinds of Ages fills the speakers with kick-drum driven extreme metal, with plenty of melody and rasping growls. There’s a sense of theatre in their music thanks to keyboards and choral effects. The intense blasting of An Empire To Mourn features strands of both death and black metal, fusing them together in perfect harmony. The keyboard add yet mystical melody and at times VS reminds of Scandinavian acts like Insomnuim and Dark Tranquillity. That’s not so say they are merely copying those bands though, as they certainly have their own sound. The buzzsaw riffing contained on Casting Dawn Into Shadow really gets the heart racing. The operatic clean vocals that sit within it, fit right in too. The grandeur that’s created by VS spills over here. The soloing, while sounding very clean (if a little overproduced) is breathtaking. VS go in a slightly more urgent direction on Crown Of Glass and Legacies Befallen. The former flails with evil death metal and haunting synths before giving way to sultry acoustic guitar midway through, while the frenetic pace of the latter proving almost too much at times! Their longest number comes in the form of Eye Of The Clocktower. It brims with modern metal, including the heavier end of metalcore (dare I say it!). The clean vocals are great amidst the chaos and extremity. Their back at their anthem best during Oracle From The Ashes, which again brings forth images of Nordic battles and pillaging. The strings at the beginning of Relics Of The Impure strengthens VS’s grand anthemic sound. With the growls set to that backdrop, you can’t help but be sucked in. I also forgot to mention how insanely fast the drums were! In fact, Relics Of The Impure flashes past without you realising and immediately, you’re flung into Death She Cried. It’s complete with melodrama and plenty of raw emotion, that is a feeling that often gets lost on me when listening to the more theatrical end of extreme metal. VS have truly touched me here. Their final quicker blast is Of Opiates And Accolades. It helps Stormwinds Of Ages to end on a high note. Normally, I don’t go for records like this but as I listened to it and got more into it, I realised that when an album like this is well-produced and instrumentally sound, it’s a joy to listen. It’s not my favourite strand of extreme metal but Vesperian Sorrow are a quality band and deserve the attention they’re getting. There's also digital download and physical merch options available too!